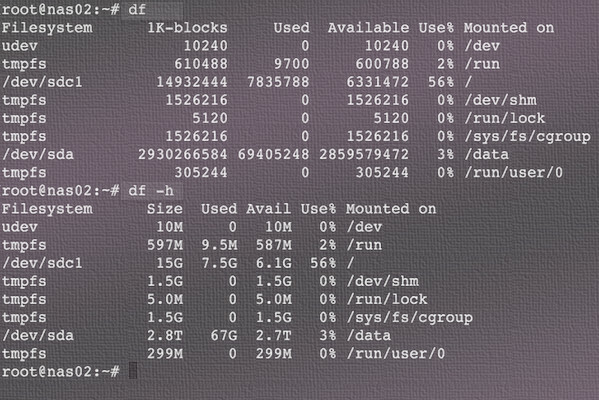 df command – Shows the amount of disk space used and available on Linux file systems. du command – Display the amount of disk space used by the specified files and for each subdirectory. btrfs fi df /device/ – Show disk space usage information for a btrfs based mount point/file system. Open the terminal and type the following command to check disk space. The items in square brackets are optional. You can simply type the df command (i.e. no arguments), to see a table that lists for each device name on the system. Filesystem source The source of the mount point, usually a device. 1K-blocks size Total number of blocks. Used used Number of used blocks. Available avail Number of available blocks. Use% pcent Percentage of USED divided by SIZE. Mounted on target The mount point. These file systems omitted by default. The first column is expressed in kilobytes (file size) and the second column is the filename or directory name. How do I summarize disk usage for given directory name? The -c option tells du to display grand total.